I know I am always going on and on about raising your plants from seed and as long as I can draw breath I will continue to do so because there is nothing more exciting than seeing the seedlings flower for the first time. 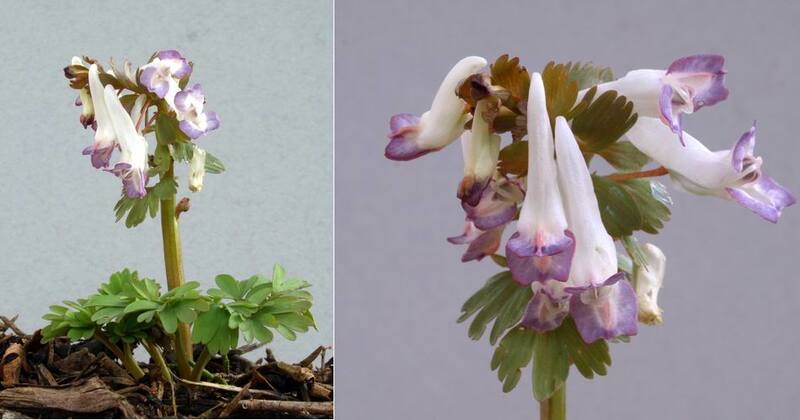 This is a lovely selection raised from our own garden seed of the wonderful 'Penza Group' of Corydalis solida that Janis Ruksans introduced. We get more variation of colours from white through to red from this group than from any of the other C. solida introductions we grow. This is the first seedling in a potful of young bulbs raised from an open pollinated plant of Ipheion 'Froyle Mill' and it is quite distinctive - I wonder what the sibling plants will look like. Although they are not the most showy of flowers I find the Muscari fascinating but you have to get up close to appreciate their charm. If you look at them even from standing up they just appear as blue spikes but get down close where you can start to see the details of each individual flower and another level of beauty is revealed. 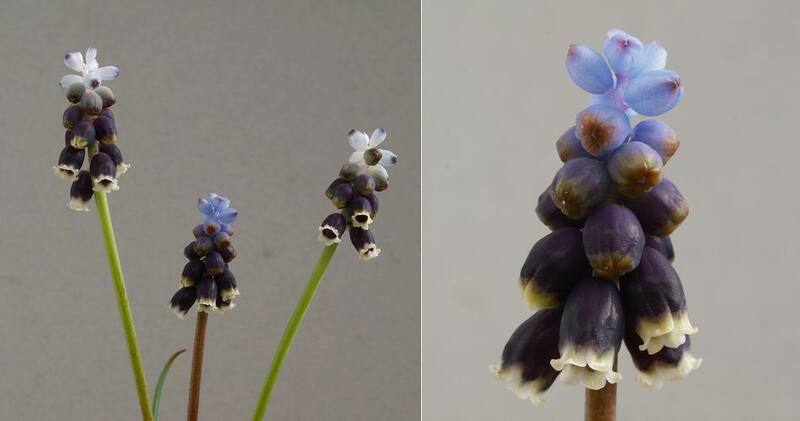 The one problem I have is I have terrible trouble naming them - well if I tell the truth I have not studied the taxonomy that closely so I tend to stick with the names I got them as such as the pale blue M. libanoticum and the seed raised Muscari sp collected in Turkey. 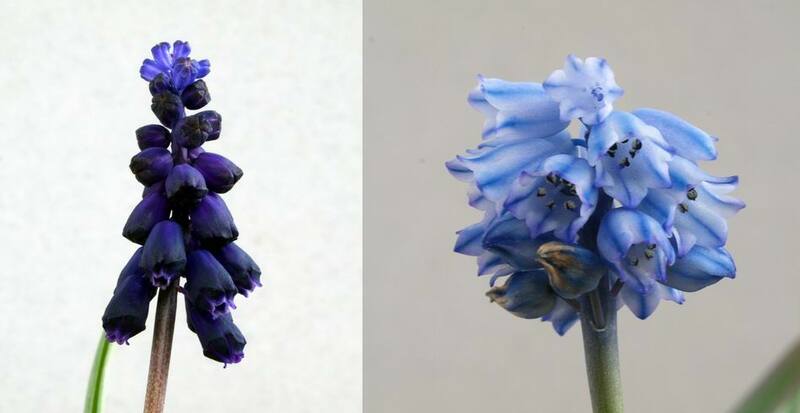 One of the most beautiful ones I grow is this miniature beauty again just Muscari species from Turkey for the moment - I was given a few years ago by a good friend so I tend to call it Arthur's Muscari to remind me of his generous gift. It is amazing how names like this can stick - when Fred Carrie was running his nursery he would sometimes come and get some cutting material from our garden and one time he liked a small compact Hebe which had self seeded in one of our beds, perhaps a hybrid between some of the many species we were growing. Fred just wrote Hebe - Ian Young on the bag with the cuttings and took it back to the nursery where his propagator assistants went to work and produced a batch of plants. The next thing I knew a few years later was my sister phoned to say she had just bought a Hebe 'Ian Young' in a garden centre; was this anything to do with me!! Obviously Fred's assistant had taken the label on the bag as the name of the plant and had labelled up all the plants for wholesale. Despite the dreadful weather conditions where one day it is mild with bright sunshine and the next freezing conditions with driving snow storms most of the bulbs are making the best of it. 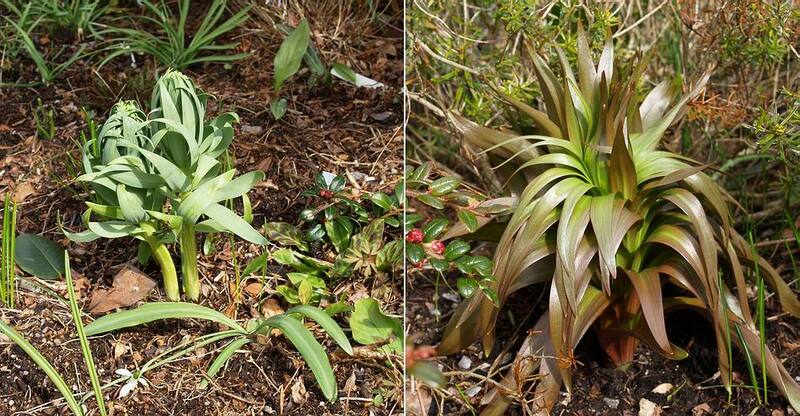 On the left is a white Fritillaria persica distinguishable even by the paler leaves and a good form of F. imperialis 'Maxima' on the right with lovely bronze edged leaves. I hope the weather improves before they start to open their flowers so I can enjoy them. 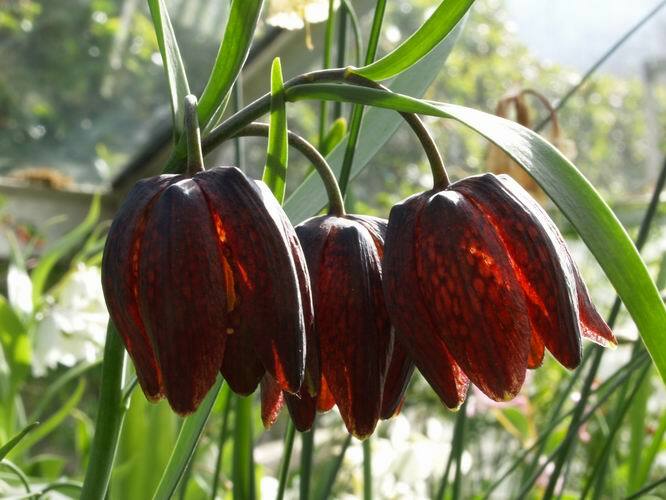 In the frit house there is an element of protection from the worst of the weather but the temperature swings are not the best conditions for pollen to grow and fertilise the ovules so I suspect it will be another poor year for fritillaria seed. 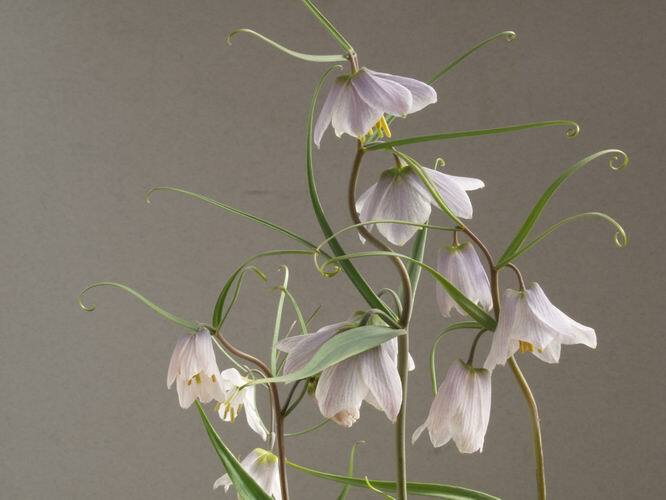 Flowering for the first time from J&JA seed is the lovely long hanging flower of Fritillaria forbesi. 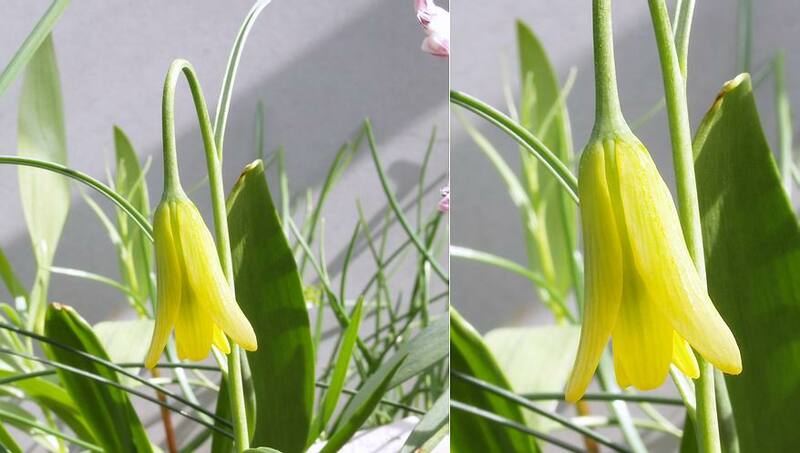 This is a rare Fritillaria in cultivation and the true plant is hardly ever seen but the name does appear; more often mistakenly applied to other plants, most commonly it is F bithynica that is the impostor. I am attending this flower daily with my paint brush transferring pollen from anther to stigma - I would love to get seed from it. 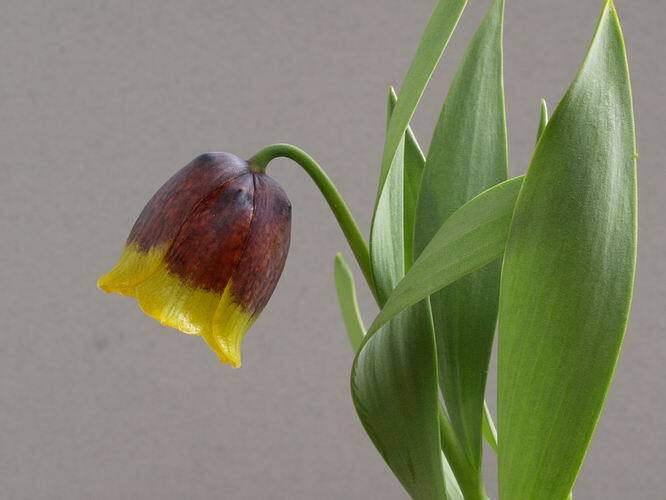 Talking about impostors here is another form of Fritillaria montana that I discussed the other week - this is a fine form with three flowers per stem. 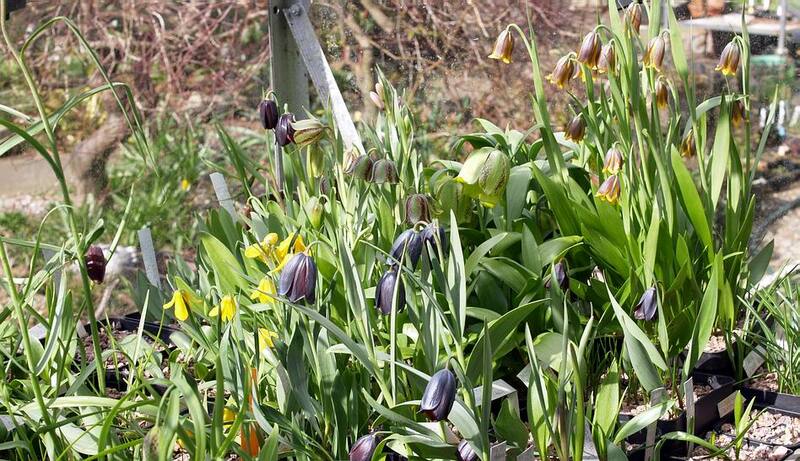 There has been some discussion in the forum recently of impostors appearing in place of Fritillaria michailovskyi. This is one of my own pots of seedlings taken from a fine form of Fritillaria michailovskyi and it has obviously hybridised with another frit in our glasshouse - I speculate that F. crassifolia is the other parent. 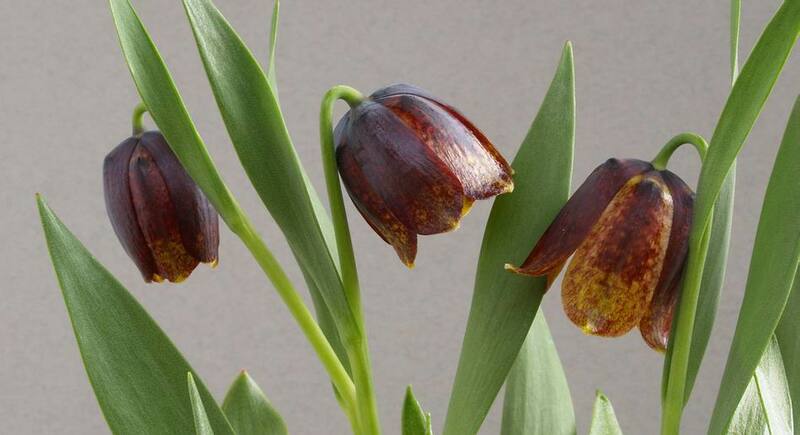 It is an interesting plant with some charm but if you were expecting the very clearly marked and beautiful Fritillaria michailovskyi then you would be justified in feeling disappointed. 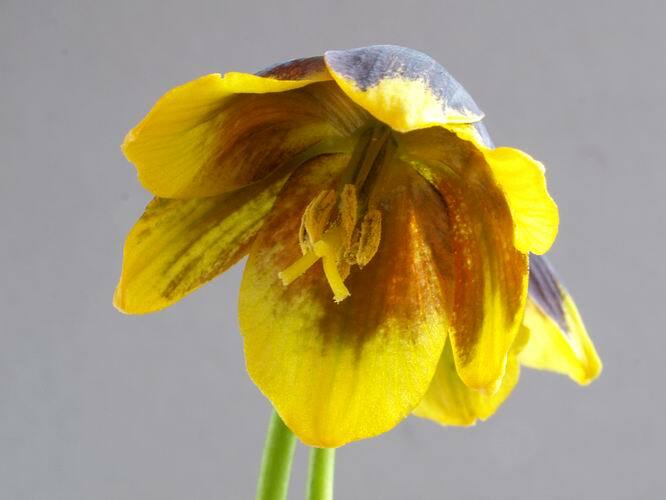 Here is the true and typical Fritillaria michailovskyi raised from seed collected many years ago in Turkey showing the very clear and dramatic break between the two contrasting colours. 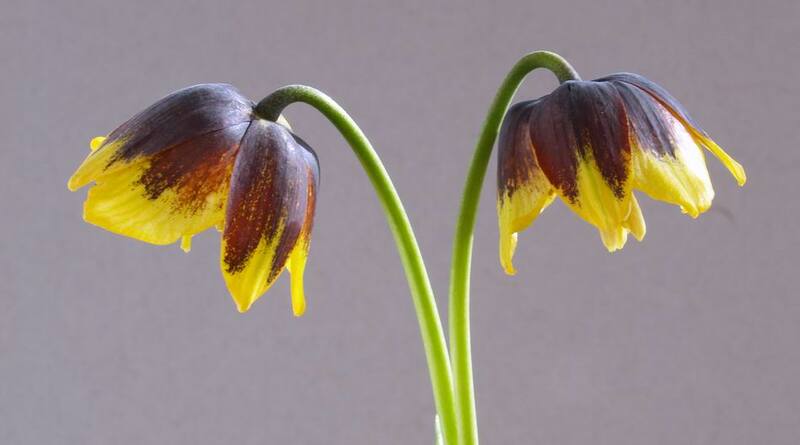 Of course Fritillaria michailovskyi is not the only one to have this colour combination Fritillaria reuteri also has the same colouring but is easily distinguished by having more open flowers among other features. 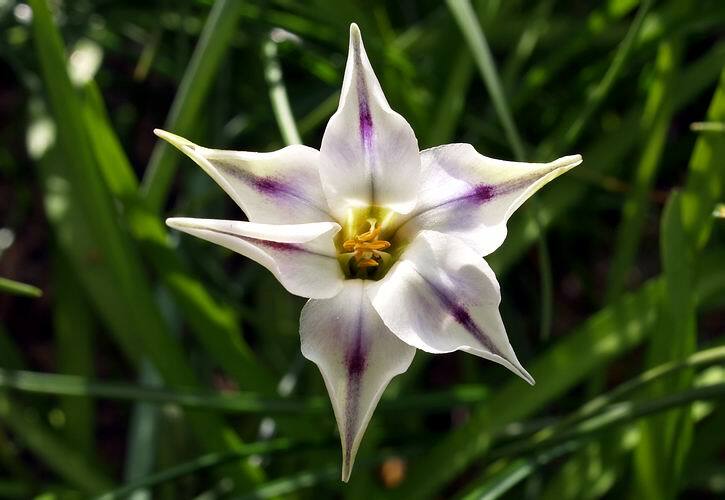 Looking up into the flowers of frits is important because it lets you see the form of the style and the shape of the nectaries at the base of the petals - these are important diagnostic characters used to identify species. I have always known these as some of the many forms of Fritillaria hermonis amana we grow but recently the Wallis' have separated F. hermonis from F. amana and one of the reasons they give in their paper is the shape of the nectary. To comply with this new order this plant on the left would now be known as Fritillaria hermonis and Fritillaria amana is on the right. 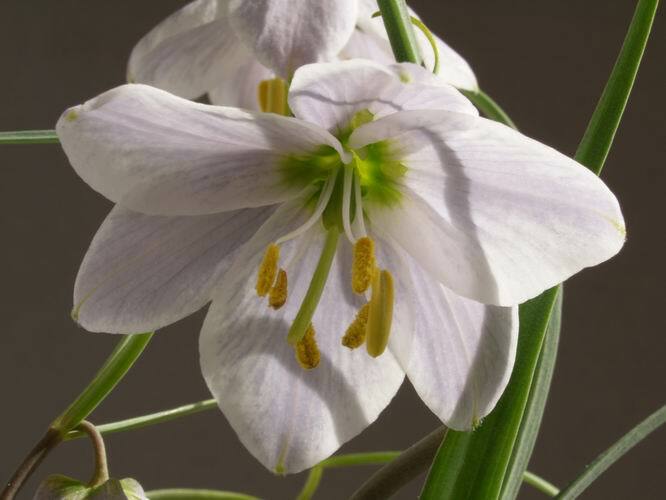 I have read the Wallis paper and I can see the clear distinction between the typical Fritillaria hermonis and the typical F. amana as they describe them but like many other species it is the forms that start to merge in the middle, the atypical forms that cause me the problems; what do I call them? 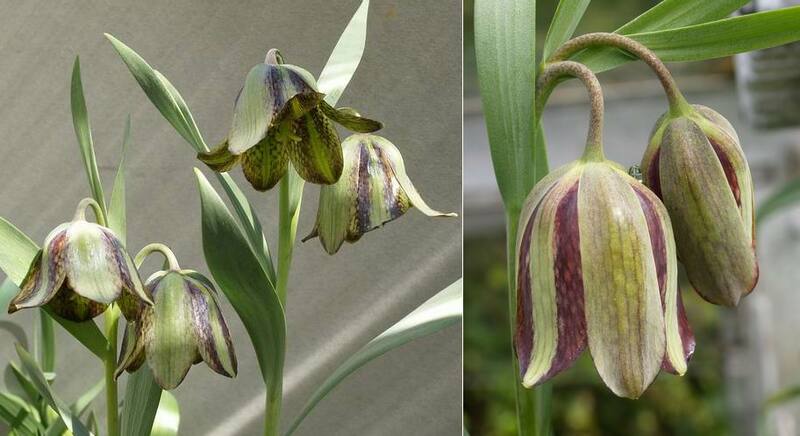 A beautiful Chinese species is Fritillaria yuminensis; it also has a nice scent. I first imported some bulbs about ten years ago and since then I have been raising it from seed when the weather allows for a successful fertilisation. To ensure the plant has the best chance to set seed I transfer pollen from the stamens to the style every day for as long as the flower remains viable. To ensure that I can continue to grow and enjoy these beautiful bulbs in the long term it is vital that I raise them from seed on a regular basis and that I do not just rely on the vegetative, clonal, methods of propagation. The myth that allowing a bulb to set seed weakens the bulb is in my mind not true. I have conducted trials and found that the bulb that has been fertilised and allowed to set seed grows for four to six weeks longer than the same bulb that is not setting seed. That extra growing time is more than enough time for the plant to take up the extra energy required to produce the seed and grow the bulb to a good size.